Properties in La Tournette average 4.6 out of 5 stars. 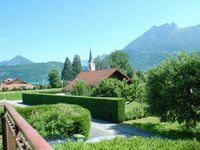 RENTAL VILLA VERY GOOD STANDING LAKE ANNECY for 8 p.
Property 59: RENTAL VILLA VERY GOOD STANDING LAKE ANNECY for 8 p.
Property 60: Spacious Cottage Like Duplex, Quiet and minutes away by foot to everything. Great location, close to everything you need. Very comfortable property with lovely outdoor areas and a beautiful view to wake up to. The owner made everything very easy for our stay, thank you. We thoroughly enjoyed staying at this house in Duingt. The village itself is centrally located but quiet and retains a local feel. The house is large, very well maintained, even has AC which was nice in the August heatwave. Communications were great with Sophie and her team. Everything we had hoped for our family vacation for all 5 of us.